99 records – page 1 of 2. 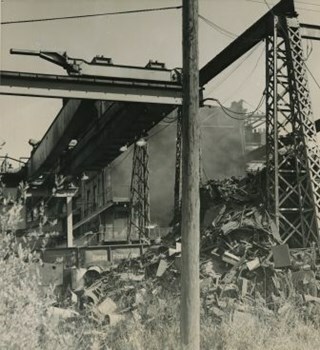 Photograph of the exterior of the Adley Substation, beside the Great Northern Railway tracks near Willingdon Avenue. 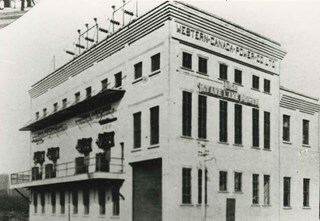 Signs on the building read: "Western Canada Power Co. Ltd." and "Use Stave Lake Power." 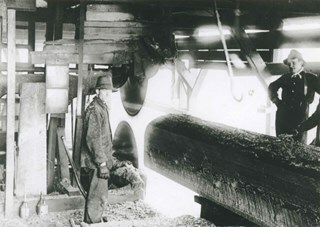 Photograph of two labourers standing inside Phillips Lumber Mill at Guichon Creek and Mayne Avenue (now Willingdon). 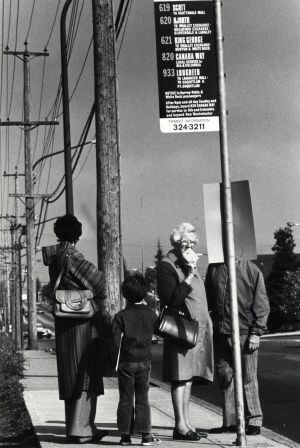 Photograph shows people waiting for a bus at a stop on Willingdon Street, across from Brentwood Mall. Photograph of a paved road lined with electric posts, a sidewalk and fences. There are two unidentified men in suits and bowler hats standing on one side of the road, each by a different electric post. A car is driving towards the horizon. 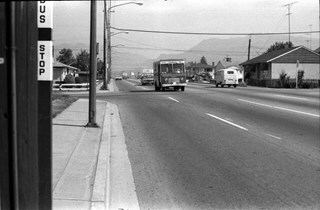 An earlier catalogue record from 1988 notes that the view is of Kingsway looking east from Willingdon Avenue towards the community of McKay and Kingsway. 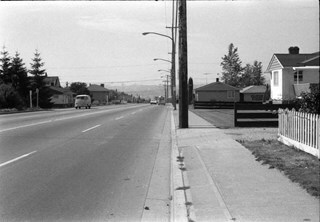 It also notes that the McKay Block is visible on the far right side of the photograph at McKay Avenue and Kingsway. The record dates the negative ca. 1914. 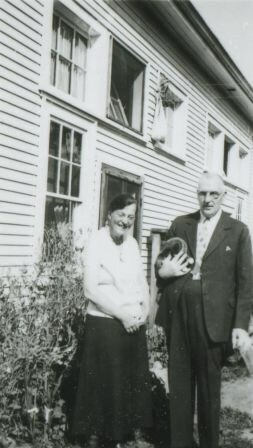 Photograph of brother and sister, Flo Nichols and George F. Nichols, standing at the side of a motel on the southeast corner of Willingdon Avenue and Kingsway. 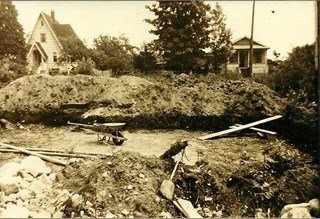 Annotation at bottom of photograph reads, "Flo and George Nichols"
Photograph of Burnaby Fire Hall No. 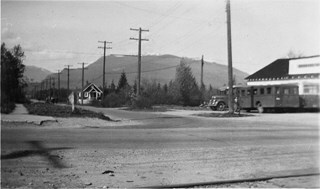 1 at Willingdon and Hastings, the first purpose built fire hall in Burnaby. The hall is a two storey modern concrete building with three large bays. Fire trucks are parked in front of the hall, along with two cars. 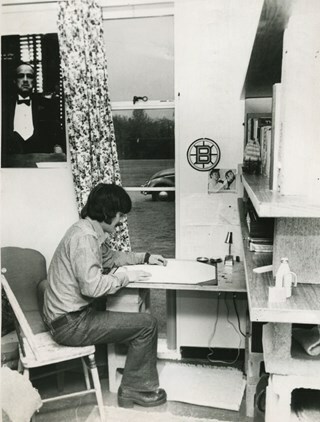 Typed sticker on verso of photograph reads: "First new Burnaby firehall [sic] No. 1 Willingdon & Hastings 1947"
Address sticker on verso of photograph reads: "MR & MRS F BLAKE 4165 PANDORA ST BURNABY BC V5C 2B2"
Photograph of four unidentified Burnaby Fire Department trainees standing in front of a 1954 triple combination LaFrance fire engine at Confederation Park. Typed sticker on verso of photograph reads: "Trainees (1956) with 1954/ Triple Combination La-/ France fire engine at/ Confederation Park." 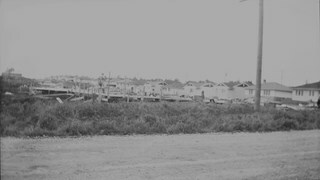 Address sticker on verso of photograph reads: "MR & MRS F BLAKE 4165 Pandora Street Burnaby BC Canada V5C 2B2"
Typed sticker on verso of photograph reads: "Trainees (1956) with 1954 Triple Combination La- France fire engine at Confederation Park." 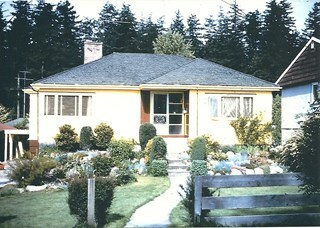 Address sticker on verso of photograph reads:"MR & MRS F BLAKE 4165 Pandora Street Burnaby BC Canada V5C 2B2"
Photograph of Graveley Street and Willingdon Avenue (north) with houses along one side and trees and brush along the other side. This is part of the Willingdon Heights subdivision site. 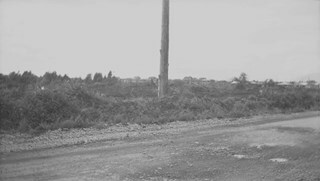 Photograph of Kitchener Street and Willingdon Avenue with empty land in the foreground and houses visible in the distance. This is part of the Willingdon Heights subdivision site. 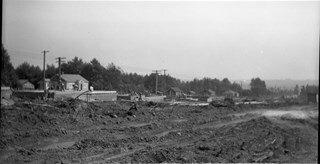 Photograph of Napier Street and Willingdon Avenue with houses under construction and nearing completion. This is part of the Willingdon Heights subdivision site. 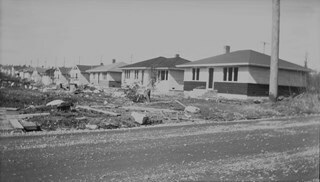 Photograph of Napier Street and Willingdon Avenue with the road in the foreground and houses under construction, some of which are completed or nearing completion, in the background. This is part of the Willingdon Heights subdivision site. 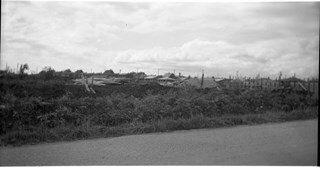 Photograph of Willingdon Avenue and William Street with the road in the foreground, lumber and cleared land in the centre, and houses in the background. This is part of the Willingdon Heights subdivision site. 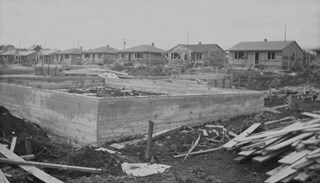 Photograph of William Street and Willingdon Avenue with houses under construction, and a house foundation in the foreground. This is part of the Willingdon Heights subdivision site. Photograph of Charles Street and Willingdon Avenue with the road in the foreground and houses under construction in the background. This is part of the Willingdon Heights subdivision site. 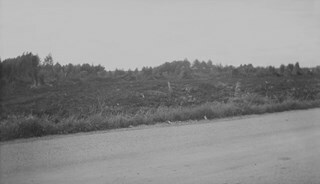 Photograph of Kitchener Street and Willingdon Avenue with the road in the foreground, brush at the side of the road and houses in distance. This is part of the Willingdon Heights subdivision site. 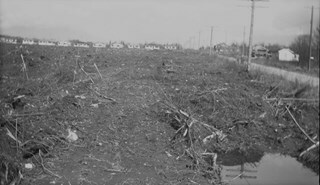 Photograph of cleared land and brush at Grant Street and Willingdon Avenue (southeast). This is part of the Willingdon Heights subdivision site. 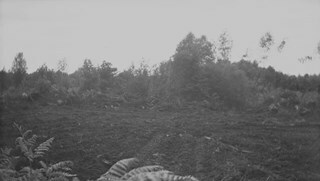 Photograph of Graveley Street at Willingdon Avenue; the road is in the foreground with brush and cleared land visible beside the road. This is part of the Willingdon Heights subdivision site. 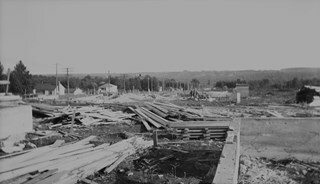 Photograph of William Street and Willingdon Avenue with houses under construction. This is part of the Willingdon Heights subdivision site. 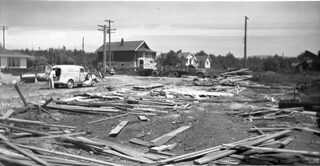 Photograph of Napier Street and Willingdon Avenue with lumber scattered on a cleared area and houses in the background. There are vehicles on the road, including a truck whose side reads "Mother Hubbard Bread" and machinery reading "G.W. Ledingham, Contractors." This is part of the Willingdon Heights subdivision site. Photograph of Charles Street and Willingdon Avenue with houses under construction on the left side of the road. This is part of the Willingdon Heights subdivision site. 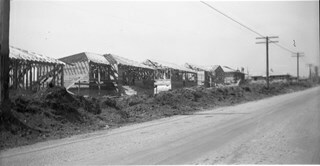 Photograph of Charles Street and Willingdon Avenue with houses under construction and construction workers. This is part of the Willingdon Heights subdivision site. 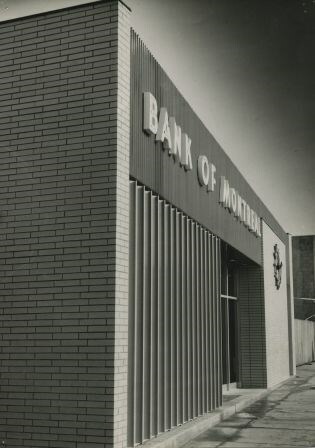 Photograph of the exterior of the Bank of Montreal at 418 Willingdon Avenue and Hastings Street. Photograph of the Murley brothers in three-piece suits with hats in their hands, standing on either side of their sister who dressed in a white dress, cape and crown, as she is the May Queen. 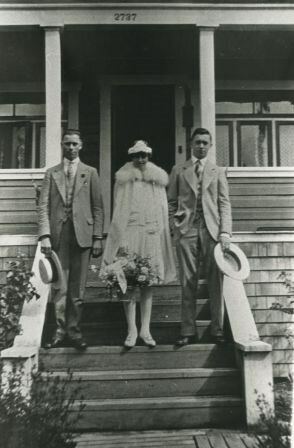 Left to right: Horace Murley, Sylvia Murley and Dennis Murley standing on the steps of the Murley family home, 2737 Willingdon Avenue (later renumbered 6378 Willingdon Avenue) in the McKay area. Photograph of Pixie McGeachie, unidentified, and Florence Godwin sitting inside, in front of the windows at the Metrotown Branch of the Burnaby Public Library. 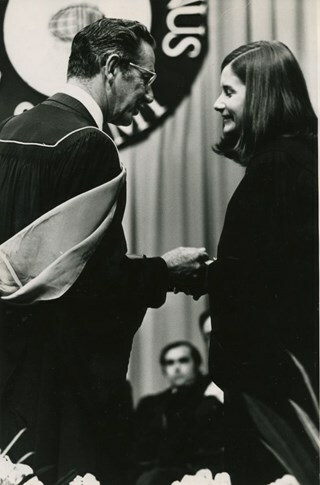 Photograph of Catherine Rees talking to a man inside the Metrotown Branch of the Burnaby Public Library. 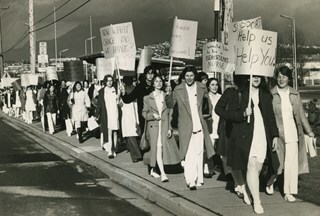 Photograph of Pixie McGeachie and Florence Godwin standing together in front of the windows at the Metrotown Branch of the Burnaby Public Library. Photograph of Catherine Rees standing with her hand resting on Gwen Pitman's chair, as she sits, with both hands resting on her cane at the Metrotown Branch of the Burnaby Public Library. 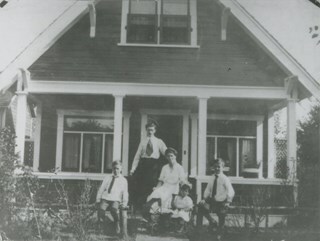 Photograph of (left to right): Lillian Lamont, Alice Rudolf, May Jackson, and Thelma Rudolf, at the front of 2737 Willingdon Ave (later renumbered 6378 Willingdon Avenue). The child behind them is unidentified. 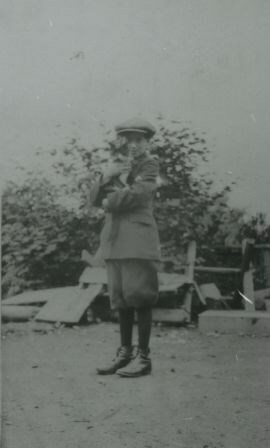 Photograph of Dennis Murley holding a cat at the back of 2737 Willingdon Avenue (later renumbered 6378 Willingdon Avenue). 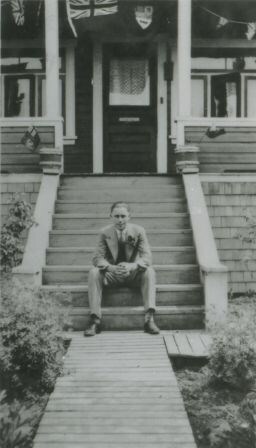 Photograph of Horace Murley seated on the front steps of his family home at 2737 Willingdon Avenue (later renumbered 6378 Willingdon Avenue). Flags are decorating the porch. 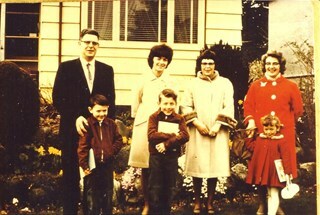 Photograph of the Murley family in front of their home at 2737 Willingdon Avenue (later renumbered 6378 Willingdon Avenue) before the house was raised. 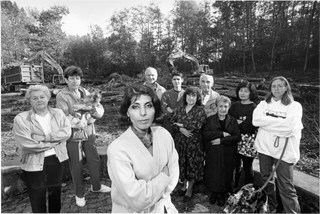 Left to right: Horace, Alf, Emma, Sylvia, and Dennis Murley. 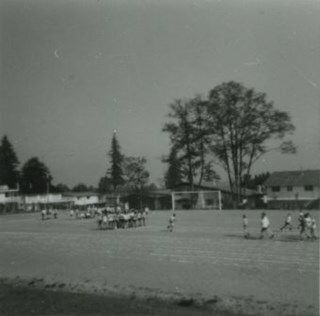 Photograph of Sports Day at Chaffey-Burke School. Children are running on a field. 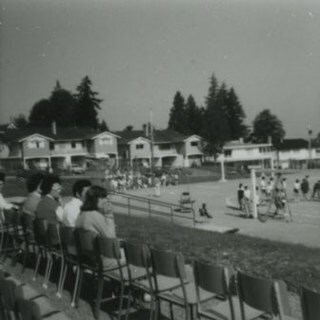 Photograph of Sports Day at Chaffey-Burke School. Children are participating in activities on a field while adults look on. 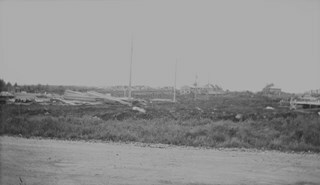 Houses are visible in the background. 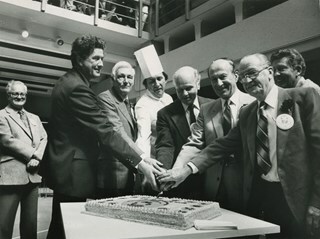 Photograph of staff at Chaffey-Burke School. 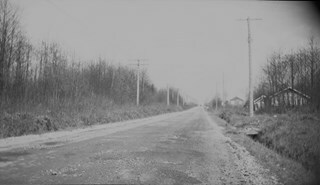 Photograph of the intersection at Willingdon Avenue and Hastings Street, facing north from the southwest corner. 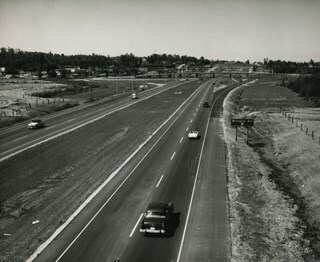 Photograph of the Freeway, now named the Trans Canada Highway, near the Willingdon Avenue exit.